Henry Casey Camp No. 92 Sons of Union Veterans of the Civil War recently elected and installed officers for the year 2019. The installing officer (right) Dennis Brown, Ohio Department Chief of Staff, presents the presiding officers gavel to newly installed camp commander Terrance Thevenin. Other officers pictured (left to right) are: Shawn A. Cox, historian; Shane L. Milburn, secretary, and Robert E. Grim, treasurer. Henry Casey Camp 92 Sons of Union Veterans of the Civil War (SUVCW) has elected and installed its officers for 2019. The installing officer during the ceremonies was Dennis Brown, chief of staff of the Ohio Department Sons of Union Veterans of the Civil War (SUVCW). The camp officers for 2019 are: Terrance Thevenin, commander; Joe Daugherty, senior vice commander; Jason R. Cassio, junior vice commander; Shane Milburn, secretary, Robert E. Grim, treasurer; Terrance Cochran, chaplain; and Shawn A. Cox, historian. Brown praised the camp members for their outstanding efforts in helping preserve the history of the American Civil War and helping preserve the heritage of the brave men who saved our Union of States. Brown also gave special recognition to Joshua Cassio, who was named the nation’s most outstanding SUVCW Junior Member at the SUVCW’s National Encampment held in Framingham, Mass. last August, and to Robert Grim, who was presented the SUVCW’s Life Time Achievement Award at that national encampment. The camp is named in honor of Henry Casey, a Civil War Medal of Honor recipient. The SUVCW is a congressionally-chartered organization dedicated to preserving the heritage of the Grand Army of the Republic (G.A.R.) and the men who served in the Union military forces during the Civil War. Several of the Henry Casey Camp members also belong to the Sons of Veterans Reserve (SVR), which is the uniformed division of the SUVCW and participate in ceremonies dressed in their Civil War uniforms. The local SVR unit is Company C, 20th Ohio Volunteer Infantry. The unit is named in honor of the unit Henry Casey served in during the Civil War. The unit is commanded by 1st Lt. Shane Milburn who also serves as the adjutant of the SVR 3rd Military District, which encompasses Ohio, Indiana, Kentucky and Michigan. The national commanding general of the SVR is Robert E. Grim, who is also a member of the local unit. https://www.recordherald.com/wp-content/uploads/sites/27/2019/01/web1_Officer-installation-2019.jpgHenry Casey Camp No. 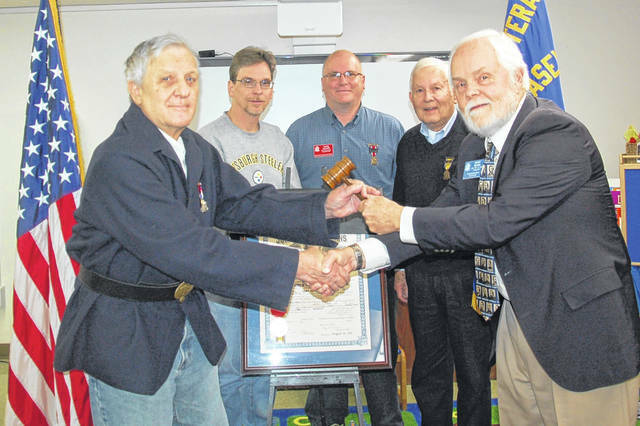 92 Sons of Union Veterans of the Civil War recently elected and installed officers for the year 2019. The installing officer (right) Dennis Brown, Ohio Department Chief of Staff, presents the presiding officers gavel to newly installed camp commander Terrance Thevenin. Other officers pictured (left to right) are: Shawn A. Cox, historian; Shane L. Milburn, secretary, and Robert E. Grim, treasurer.